ST-LAZARE, Man. 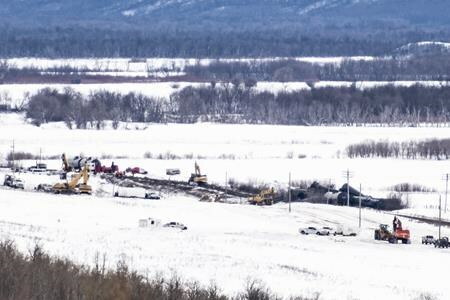 — CN has apologized to a Manitoba rancher after one of its trains derailed and spilled oil on his land. A company spokesman says CN vice-president Sean Finn has spoken directly with Jayme Corr about how to fix any damage resulting from Saturday’s spill. Corr says Finn apologized for taking so long to reach out to him. He says the railway initially gave him little information, despite the spill being on a frozen river oxbow that Corr uses to water his cattle in the summer. CN still can’t say how many cars were leaking or how much oil was spilled. Trains resumed running at noon on Sunday. Cleanup crews from CN and investigators from the Transportation Safety Board are at the spill site.